The SS established the Sachsenhausen concentration camp as the principal concentration camp for the Berlin area. Located near Oranienburg, north of Berlin, theSachsenhausen camp opened on July 12, 1936, when the SS transferred 50 prisoners from the Esterwegen concentration camp to begin construction of the camp. Jews arrested during Kristallnacht stand under guard before being deported to the Sachsenhausen concentration camp. Zeven, Germany, November 10, 1938. 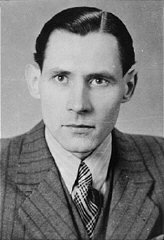 Karl-Heinz Kusserow, a Jehovah's witness who was imprisoned by the Nazis because of his beliefs. He was a prisoner in the Dachau and Sachsenhausen concentration camps in Germany. 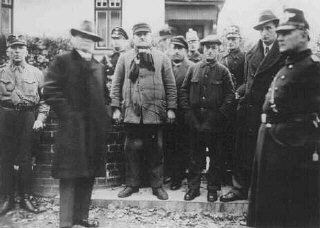 In the early stage of the camp's existence the SS and police incarcerated mainly political opponents and real or perceived criminal offenders in Sachsenhausen. By the end of 1936, the camp held 1,600 prisoners. Between 1936 and 1945, however, Sachsenhausen also held Jews, homosexuals, Jehovah's Witnesses, "asocials" (among these prisoners were Roma and Sinti), and, later, Soviet civilians. Prominent figures interned in Sachsenhausen included Pastor Martin Niemöller, former Austrian chancellor Kurt von Schuschnigg, Georg Elser, Herschel Grynszpan, and Joseph Stalin's son, Iakov Dzhugashvili. An official order incarcerating the accused in the Sachsenhausen concentration camp for committing homosexual acts. The number of Jewish prisoners in Sachsenhausen varied over the course of the camp's existence, but ranged from 21 at the beginning of 1937 to 11,100 at the beginning of 1945. During the nationwide Kristallnacht ("Night of Broken Glass") pogrom of November 1938, Reichsführer SS (SS chief) and Chief of German Police Heinrich Himmler ordered the arrest of up to 30,000 Jews. The SS transported those arrested to Sachsenhausen, Dachau, and Buchenwald concentration camps. Almost 6,000 Jews arrived in Sachsenhausen in the days following the _Kristallnacht _riots. During the years 1938-1939 Sachsenhausen experienced frequent changes in camp leadership. At the beginning of 1940,SS-Oberführer [an SS rank between colonel and brigadier general, for which there is no English equivalent] Hans Loritz took over as camp commandant. SS Lieutenant Colonel Anton Kaindl replaced Loritz in 1942 and held the position of camp commandant until 1945. The guards of Sachsenhausen in the early years of the camp were men from the SS Death's Head units (SS-Totenkopfverbände); later, members of the Waffen-SS were transferred to the SS Death's Head Battalion and deployed as guards. In June 1941, camp authorities transported 269 prisoners selected under 14f13 to Sonnenstein, a sanitarium equipped with a gas chamber that served as a killing center for people with disabilities living in institutions. German medical professionals gassed these prisoners at Sonnenstein. 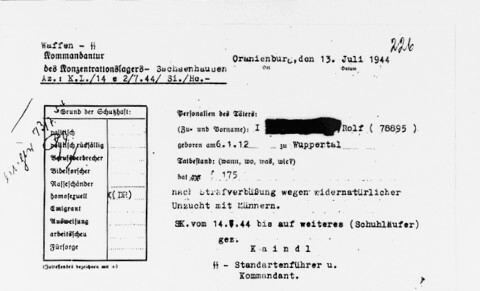 Camp authorities conducted further selections in October 1942, selecting prisoners they deemed unfit to work and transporting them to the Dachau concentration camp. In 1944 the camp authorities sent "unfit" prisoners to the Bergen-Belsenconcentration camp.